I saw these adorable cookies on Pintrest and had to make them myself! Aren’t they super cute? And they taste pretty yummy! The only difference is that instead of 1 cup of sugar, I added 2/3 cup because I don’t like super sweet desserts. 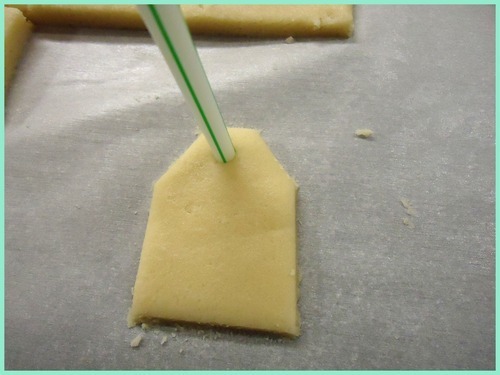 After I had the dough rolled out, I used the cookie cutter that I made (coming up in the next tutorial) to cut out teabag shaped cookies and poked a hole in the top using a straw. 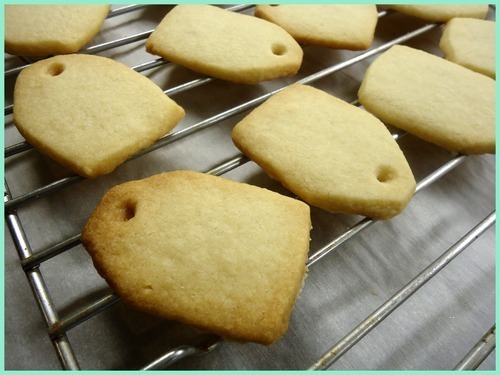 Bake them as directed on parchment paper and let them cool completely before dipping them in chocolate. 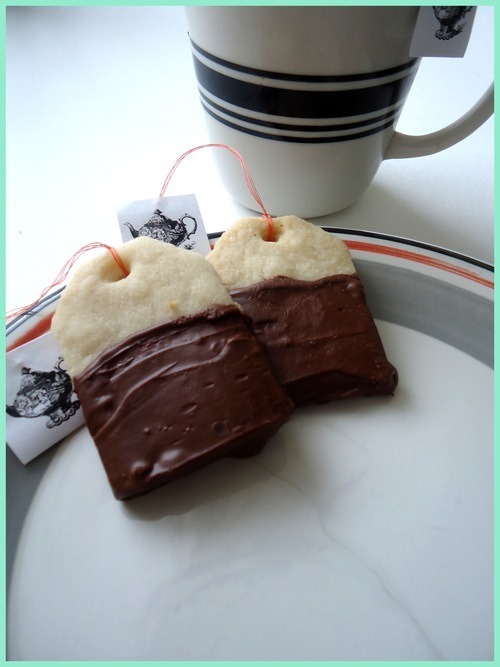 To make the teabag tags, print out mirror images of clipart (like vintage teapots) and fold them. Cut close to the image in the shape of a square. Cut a bit of string (about 10 inches long) and tie the ends together in a knot. 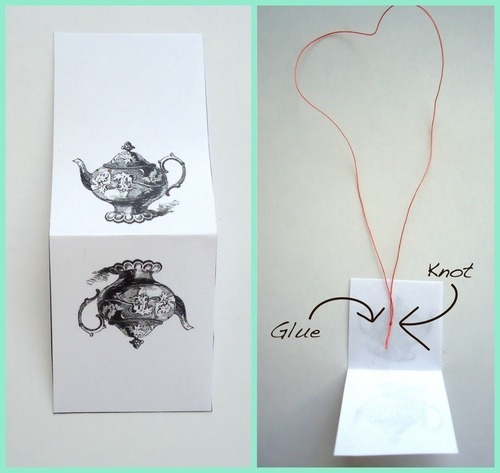 Add glue to the inside of the tag and sandwich the string between the tag. 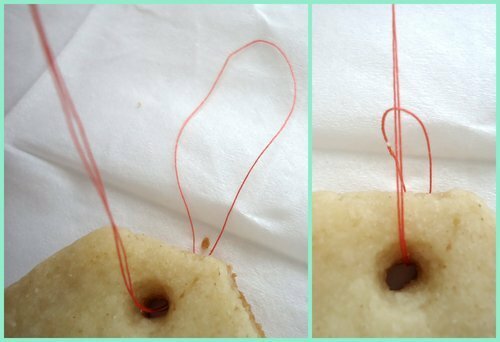 Place the end of the string through the hole at the top of the cookies until you’ve created a loop. Next, put the tag through the loop. 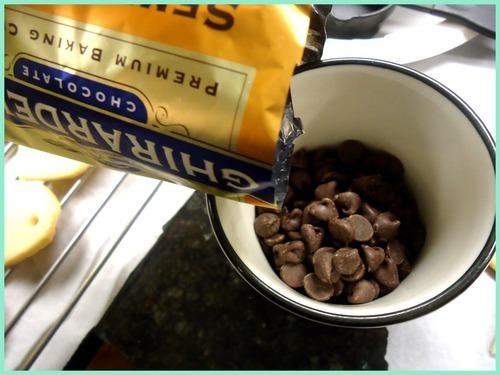 For the chocolate, I put about 1 cup of semi-sweet chocolate chips in a cup (or any narrow container) and microwaved it in 30 second intervals, stirring frequently, until the chocolate was completely melted. 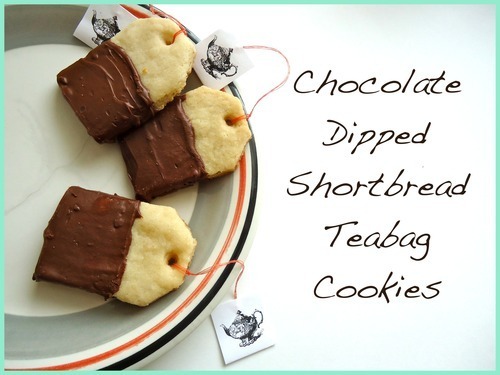 Dip the cookies in the melted chocolate and let it cool. They look superduper cute doesn't they? Hmm klinkt lekker. Ziet er ook erg cute uit. Hmmm, ziet er heeerlijk uit! Echt super schattig! lijkt me leuk om te maken.